At EPS, we are your z/OS performance partners! Let us help you optimize your mainframe performance and capacity and control your mainframe costs. Pivotor provides comprehensive performance reporting, leads you through analyses with performance playlists, and educates you with explanations. Best of all Pivotor is easy to use, even easier to manage, and very easy on your budget. Don't just go to a class, attend our educational workshops where you'll analyze and improve your own systems. Pivotor reads data (most commonly, but not limited to, z/OS SMF performance data) and produces information in the form of charts and reports. Related reports can be grouped into report sets. Report sets are accessed from a calendar view that makes it easy to find the reports that you need for the time you're interested in. Pivotor processes a wide range of SMF records, with all the key / major SMF records supported. However, Pivotor is not limited to SMF data. Pivotor can absorb customer- and vendor-specific data files, as well as a variety of other non-SMF z/OS performance data sources. 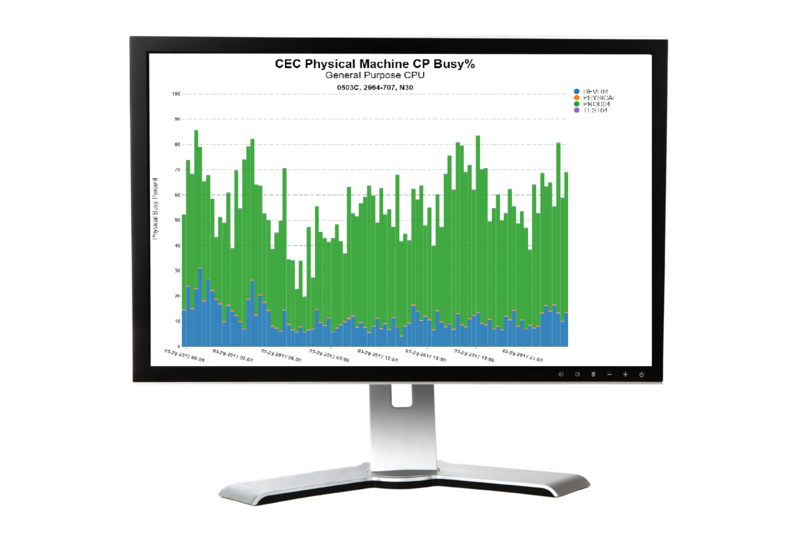 Pivotor’s performance report sets were designed and developed by z/OS performance experts with decades of z/OS experience. More than just echoing the raw data in a pretty graph, many reports contain calculated data and recommended thresholds. Report sets are designed to contain logical groupings of reports that enable high-level to low-level performance reviews. Pivotor has always been available as a software service, and that continues to be how most customers use Pivotor. Every day, customers securely submit their SMF data via FTP which is then processed to produce extensive sets of performance reports. Pivotor is also offered as an installable product. As part of the initial configuration and setup of a new Pivotor customer, Enterprise Performance Strategies often develops custom reports for customers. While most customers find that the wide scope of standard reports delivered with the Pivotor service already covers the vast majority of their reporting requirements, custom reports are always an option. All Pivotor report sets are initially displayed to the user in thumbnail format. It is often possible to scan a large volume of reports very quickly in the thumbnail view to find anomalies. Our rolling 8-day report set is particularly helpful for finding things that might have gone wrong yesterday. Some mainframe performance reporting solutions require the use of expensive mainframe resources. Pivotor as a service simply requires a daily FTP of SMF data to our server. As an installed product, it can run on multiple platforms and databases, but when run on z/OS, Pivotor makes extensive use of zAAPs or zIIPs. Either way, Pivotor is quite affordable. Pricing starts at $0! Pivotor can help you optimize your mainframe environment, saving you money on hardware upgrades and software costs. Plus Pivotor is less expensive than competing products. Pivotor doesn't require you to have specialized software skills in order to use it. With our Pivotor SaaS, not only can you eliminate your dependency on SAS expertise, you can eliminate your complicated nightly performance analysis batch window. Not artificial, Pivotor reports are based on actual intelligence from z/OS performance experts. Moreover, Pivotor report explanations help educate you about why particular reports are important. Pivotor's unique playlist feature will lead you through common analyses and explain why each report is useful in the context of that particular analysis. There's no better way to learn than by doing, and in our workshops, you will follow the progress of the topic in your own data so you can immediately relate the concepts discussed to your own situation. This 4.5 day z/OS performance workshop focuses on the metrics, techniques, and strategies necessary to effectively measure, analyze, and tune z/OS systems, as well as the z processors, memory, and DASD I/O subsystems. Covered during this workshop are workload analysis and MSU reduction strategies. The overall objective of this workshop is to provide a solid foundation of knowledge for z/OS performance analysts and capacity planners. Click here for the workshop outline. Register to join us June 10-14, 2019 in Milwaukee, WI, for this class. In this 3 day web-based workshop you will also learn how to effectively measure, monitor, and tune coupling facilities and structures. If you are new to parallel sysplex, have no fear, we will start by reviewing the basic concepts and latest details of XCF, Parallel Sysplex, coupling facilities, and data sharing. Register to join us online, July 16-18, 2019 for this class. This 4½ day class taught by Peter Enrico (sometimes joined by Scott Chapman) will give you a deeper understanding of WLM functions and abilities. You will learn considerations for re-evaluating goals over time and how to better monitor, tune, and control how WLM manages your workload. Register to join us October 21-25, 2019 in Virginia Beach, VA, for this class. Have a performance issue that you need help getting to the bottom of? Need an in-depth Health Check® of your z/OS systems? Our two-day war room sessions provide an excellent value to help with these situations. We'll have you send us data from relevant time periods, as well as certain configuration information that we'll review before coming to your site for two days of in-depth discussion. Some time after the engagement we'll follow up (if you wish) by processing another set of data and reviewing the results with you via a webinar. To get started with a War Room engagement, contact Peter. We also have extensive contacts in the industry and can bring experts in other areas such as DB2 and CICS to you for a Health Check® or war room type of engagement. At this time we are not accepting new long-term consulting engagements.